Summary: Seventeen-year-old Sadie is in love: epic, heartfelt, and utterly one-sided. The object of her obsession — ahem, affection — is her best friend,Garrett Delaney, who has been oblivious to Sadie’s feelings ever since he sauntered into her life and wowed her with his passion for Proust (not to mention his deep blue eyes). For two long, painful years, Sadie has been Garrett’s constant companion, sharing his taste in everything from tragic Russian literature to art films to ’80s indie rock — all to no avail. 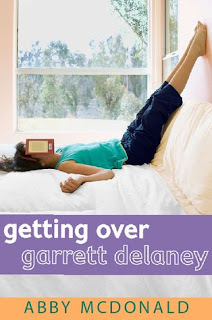 But when Garrett leaves for a summer literary retreat, Sadie is sure that the absence will make his heart grow fonder — until he calls to say he’s fallen in love. With some other girl! A heartbroken Sadie realizes that she’s finally had enough. It’s time for a total Garrett detox! Aided by a barista job, an eclectic crew of new friends (including the hunky chef, Josh), and a customized self-help guide, Sadie embarks on a summer of personal reinvention full of laughter, mortifying meltdowns, and a double shot of love. Why I Want It: Girl in love with her best friend and he hardly notices? Love that story line! Think this will be pretty cute and fun! Great choice! I love the cover as well! Love the title, love the cover, love the summary! Sounds cute! This sounds like a good one. So many great books to be waiting on. This sounds totally swoon worthy! Not a contemporary reader, but still hope YOU enjoy it when it releases!! This sounds like such a super cute book! Love the cover too. Sounds like a great contemp novel! I'm just starting to get into those! I'll have to put that on my list! I want this book, this story line is always the best.